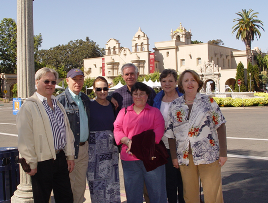 The Vergers' Guild of the Episcopal Church Board recently met at St. Paul's Cathedral in San Diego to plan the upcoming Conference. Enjoying the sites in Balbo Park are Bill Gleason and David Jette, Presidents Emeriti; Dianne Betts, Secretary; Walter Stuart, Treasurer; Kate Pendzuck, Training Course Registrar; Pat Allen, Vice President and Margaret McLarty, President. According to Canon Brooks Mason, Head Verger of St. Pauls, "This year's conference is going to be a wonderful experience for all Vergers in the Guild." More information about the conference can be found on the 2009 San Diego page of the Conferences section or at the St. Paul's Verger site.